The Scottish government has approved plans for a 10MW tidal power array on Scotland’s West coast, which when completed will be the largest of its kind in the world. ScottishPower Renewables (SPR) will install ten tidal turbines, each capable of producing 1MW of electricity, off the Sound of Islay. The project will use HS1000 tidal turbines developed by Hammerfest Strøm, a company partly-owned owned by Iberdrola (SPR’s parent company). The array will generate enough electricity for over 5000 homes – more than double the amount needed to power the island. SPR is currently constructing the first HS1000 device that will go into testing in waters off Orkney later this year. ‘The testing of the HS1000 machine in Orkney this year will help us to finalise our timetable for the demonstration project in Islay, but we will begin work on the project in 2012 and plan to have machines installed as early as feasible during the period 2013 to 2015,’ said Keith Anderson, chief executive of SPR. The HS1000 device is based on a 300kW prototype, which has been installed in Kvalsundet in Norway for the last six years. The prototype device was the first turbine in the world to convert kinetic energy in tidal waters to electricity and deliver to the grid in 2004. The Sound of Islay is a channel of water that separates the islands of Jura and Islay on Scotland’s west coast, and was chosen by SPR following a UK-wide search to find the best site for a demonstration project. The Sound of Islay benefits from strong tidal flows, shelter from storms and waves and has available grid capacity. ’Tidal power has long been considered as one of Scotland’s most valuable renewable energy resources and we have discussed its potential for many years. It is a first in terms of Marine Scotland approval for a tidal project in Scotland, and also a world first for an array of tidal power machines,’ Anderson said. The Sound of Islay project will cost an estimated £40 million, covering manufacture, transport, testing and installation costs in addition to ongoing maintenance and infrastructure. Scottish businesses have secured £4 million worth of contracts to make the turbines to be used in the development, with the largest contract going to Fife-based Burntisland Fabrication (BiFab). Scottish Power Renewables also has preliminary plans for a 95 turbine tidal project at Ness of Duncansbay in the Pentland Firth which it has submitted to the £10 million Saltire Prize for marine energy innovation. Could Fukushima derail the UK’s nuclear new build plans? Coincidentally on the other side of the world in New Zealand, Conservation Minister Kate Wilkinson has signed off the 200MW (200 turbines) tidal power station at Kaipara Harbour. Astute readers will notice this is 20 times as large as the Scottish one. I’m a bit concerned about the impact of the Scottish schemes on whales and dolphins. This week we heard of a St Andrews study which said the disturbance from offshore windfarms would lead to more beached whales. For one of the symbols of environmentalism to suffer this way would be most ironic. Now, New Zealand is noted for its whales and doplhins, though maybe less so in the Kaipara, but what about our large sea mammals there too? I note the Jura scheme is backed by the World Wildlife Fund, but have they now chosen to put carbon reduction before whales? Nowadays every project, to be approved, has to present an environmental impact assessment report, preformed by an indipendent certified body (e.g. CEFAS, see here http://www.cefas.co.uk/). So, it costs an estimated £40M with £4M in reciprocal trade, that means a £36M negative impact on balance of trade. I cannot remember all the Uk paid initiatives for development a trial in Scotland (staffa? ), some trials in Devon, and some in the Humber. So, to sumarise my disappointment; we have spent a ridiculous amount of money on academic research, studies, trials etc – then we buy on from another country giving a double impact on our groaning economy. If the presence of whales and dolphins can be detected, eg by listening to their songs, perhaps some sonic alarms could be activated to keep them at a safe distance. Given the distance that sound propagates through water, I imagine something quite low power would be needed. 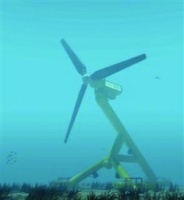 THEN there is the Australian wave energy project run by Carnegie Energy – very exciting! i Carnegie Wave Energy Limited (ASX:CWE) is focused on developing and commercialising its 100% owned CETO wave energy technology which is capable of producing zero-emission power and direct desalinated water. Fully support Eur. Ing. Graeme Vanner. Make it lagoon/pond based and you can extend the generation over a longer period and diminish environmental impact. The swishing of the Turbine should be alarm enough alarm for Dolphins and other large sea mammals? Barrage, water flow and tidal power generators can be effectively deployed in many communities around the coast and will bring employment with it…. ‘tonyw’ (first blog) has it ‘spot-on’….. not ‘the largest of its kind in the world’ at all. The Engineer’s editors should check basic facts/claims independently instead of simply mindlessly ‘parrotting’ unjustified P.R. fed to them by developers/OEM’s, trade associations, the government etc. And what a pity it’s not by a British OEM, when DECC are trying to claim we’re ‘world leaders’ at this. I have been reading “The Engineer” for just a short time now, and I am just amazed at the amount of negitivity displayed in the posts. If we could just snap our fingers and presto chang-o everything was good that would be nice but this is the real world thing are going to have to be tried out and seen how they work in real life before we can move on. “if your not part of the solution your part of the problem” I see people knocking down ideas but have none of there own to add. By building the Severn Barrage you could also enlarge the island structure to include a regional airport to cover the South West and with many fewer planning restrictions it might eventually rival Heathrow. It would also benfit from the good road rail links that already exist. It would seem to be a very difficult technology to master. Apart from the salt corrosion there will be problems with the yachtsman’s curse, barnacles, goose barnacles and general fouling. If anti-fouling paints are used the scheme won’t be very green at all so there needs to be a better way. I still believe that there is a huge amount of energy being wasted that could be tapped by micro-hydro but the problems are due to red tape. Often there are bye-laws prohibiting anything being put in the stream. Even when there are no bye-laws there is still the fear that the owners of micro-hydro plants will be billed for the water that they have “used”. “Davey of Cornwall” is concerned about corrosion and biomass growth, such as barnacles, on tidal turbines. The Rance Tidal Power Station has coped superbly for 40 years generating 240 MW at lower cost than nuclear – “1.8c per kWh, versus 2.5c per kWh for nuclear” – Wikipedia; it even repaid it’s capital cost. The Seven Barrage could replace 4 nuclear power stations, a more ambitious barrage placement will replace 8 nuclear stations. Generate in both directions and with a lagoon it would achieve continuous output. Barrage turbines can have strainers / guards to prevent dolphin ingress. Local tidal “windmills as being installed in Scotland could be ideal for local island generation; like micro hydro on all those old mill weirs is ideal for the countryside. For cities, has anyone considered Stirling engines powering a house electrically where the engines exhaust heats a condensing boiler for central heating – they are commercially available. DC can be useful at VERY high voltages to transmit power long distances without the parasitic losses of AC. DC around the home has too many voltages to service, as stated above.